I’ve got an excellent update to our ongoing experiments on concert rioting, live music fears and similar concert crisis related explorations. This is really an amazing collection of research that has me thinking about a lot of other possibilities related to our previous experiments on riots, heavy metal shows and even our RIP and mourning explorations where lives were lost because of chaos as frantic crowd situations. The project began when one student, Jesse Silverberg, took his girlfriend to a heavy metal concert. Not wanting to get involved in the mosh pit that formed in the audience–people get hurt–he stood aside and was fascinated by the motion of the crowd. The group’s movement resembled something he saw in physics classes, the disordered collisions of molecules in a gas. Bierbaum reported at the meeting that while the crowds seemed to be running around wildly, the researchers found two types of people in the patterns, subjects they called MASHERS (Mobile Active Simulated Humanoids). Some “flocked,” meaning they generally followed their neighbors. Animals flock the same way, Bierbaum said. So do fish schools. There is no bird or fish in charge. Those who stayed stationary, passive MASHERS, reacted normally when an active MASHER accidentally collided with them–they bounced–and then resumed standing still. 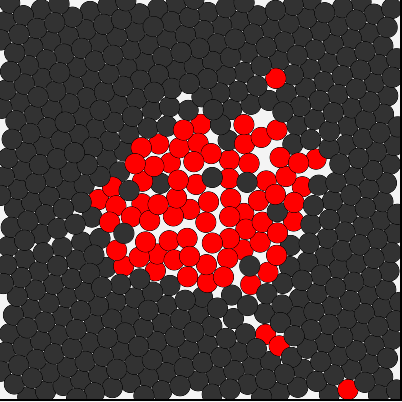 There’s also some very interesting and fascinating mosh pit data collected here that was used in the research along with this mosh pit simulator. I also love it how Jessie’s desire to not want to be in the mosh pit led him to the discovery. I can’t tell you how many times I’ve looked at mosh pits and wondered why those happen and what purpose they serve at concert beyond a physical release or just a dangerously chaotic response to how the music is making us feel during the show. And I’m pumped to see something positive come out of moshing and know that Jessie and his fellow students have given us some great insight through the lens of physics that could really make a major impact on the lives of concert fans. Lastly, this makes me wonder about what other parts of the concert experience can be better understood by looking at other areas of life or scientific disciplines to find solutions to problems? If we can compare mosh pits to gas molecules to make concerts safer, what other examples and comparisons can we find to enhance, improve and better understand the concert experience? Like I said, this is great stuff and we’ll certainly continue to follow this story and share more updates as we dive deeper into the data and uncover more awesomeness. That’s it for now. Let us know what you think of this study in the comments below and stay tuned for more as we continue to explore this story and have the Cornell students share more about their research and favorite concert experiences on a future episode of Live Fix Radio.